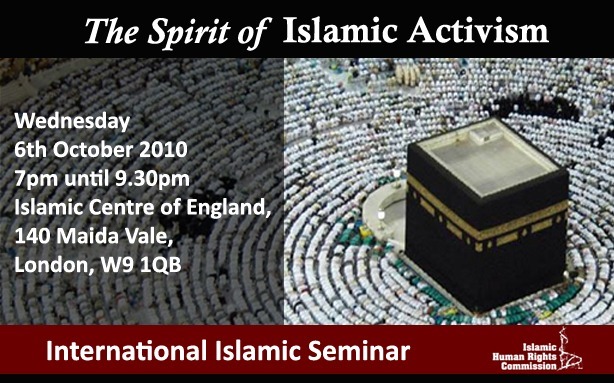 The Islamic Human Rights Commission is proud to present its upcoming seminar entitled ‘The Spirit of Islamic Activism’. This is a one-day event discussing the major challenges to the revitalisation of faith & practice in the modern world. This program features lectures from renowned speakers including Sheikh Ibraheem Zakzaky, the leader of the Islamic Movement of Nigeria; Mohideen Abdul Kader, from Citizens International in Malaysia; Ahmet Faruk Unsal, from Mazlumder in Turkey; and Sayyed Saeed Reza Ameli, from the University of Tehran, I. R. Iran. This is an evening event for the whole family and admission is free of charge.